Architecte de formation, grand voyageur, l'artiste-écrivain anglais William Henry Bartlett (1809-1854) fut l'un des plus grands illustrateurs paysagistes de sa génération. 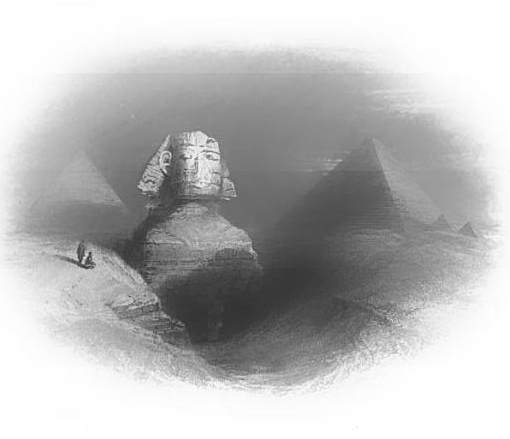 “A majestic apparition suddenly burst upon us - an enormous head and shoulders, whitened by the moonlight, towered above the extremity of one of the sand ravines which lay in obscurity below, through which, far beneath the chest of the statue, dimly peeped out the traces of the winged globe upon the tablet formerly buried beneath its paws. The features were much mutilated, yet an expression faintly beamed through them of bland repose and immutable serenity. The pyramids in all their vastness arose behind. No assemblage of objects could be more awful or imposing. The heaving sands which surge up and down, like the petrified waves of a sea, by concealing the base of the Sphynx, and burying the temple and avenue of approach which formerly led up, cause it to resemble some mysterious pre-adamite monarch, or one of those gigantic genii of Arabian fiction, which make their abode in the desolate places of the earth. It is not surprising, therefore, that it should, as Wilkinson informs us, be known to the superstitious Arabs of the present day by the name of Aboolhol, or " the father of terror " or immensity. sand, was at length uncovered for a while by laborious and Sisyphus-like toil, (the sand slipping down almost as fast as it could be removed), it presented the appearance of an enormous couchant Sphynx, with gigantic paws, between which crouched, as if for protection, a miniature temple with a platform, and flights of steps for approaching it, with others leading down from the plain above. A crude brick wall protected it from the sand.